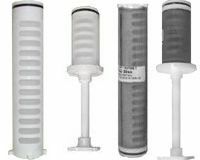 Select your Rusco sediment filter, Rusco water filter, or Rusco replacement part below. Rusco filtration systems use unique separation technology to separate sediment particles from your water supply. Rusco filter systems are available in 13 different mesh sizes to filter out larger sediment particles before they damage household appliances or industrial machines. The Rusco filter screen elements can be cleaned and reused without tools. Email support@waterfilters.net if you cannot find your Rusco water filters. Rusco: The Sediment Filter that's American Made For more information on Rusco products please see our cross reference guide.